The arc of Paul Krugman’s thinking shows the paradox of liberal reformism constrained by a conservative understanding of the possible. Paul Krugman speaking at the Commonwealth Club of California in San Francisco, May 2012. Ed Ritger / Flickr. Paul Krugman, long associated with the push towards universal healthcare in the United States, doesn’t think Democratic presidential candidates should be running on Medicare for All in 2020. Writing recently in the New York Times, the prominent liberal economist and columnist echoed a familiar (and bogus) critique charging that M4A is politically infeasible because it will force people off their current employer-provided plans. Elsewhere, Krugman has been aggressively discouraging a full-on push towards a single-payer system — warning, among other things, about its cost and the “problem” with “progressive purists” turning it into a “litmus test”. To some, Krugman’s posturing may look like a flip-flop. Many, after all, will remember that he devoted large sections of his 2007 treatise The Conscience of a Liberal to aggressive advocacy for a universal healthcare system. Fewer are likely to recall that, then as now, Krugman’s prescriptions came with a pretty major qualifier: namely that a single-payer system, though preferable in theory, would be too politically contentious and was therefore an excessively ambitious goal. It’s perplexing, to say the least, that one of America’s most prominent liberal advocates for healthcare reform has also taken to warning people about the dangers of pursuing the very model he himself suggests is best. Krugman’s well-established hostility to Bernie Sanders, going back to 2016, seems equally confusing given the innumerable columns he’s penned savaging centrist Democrats for their timidity and general refusal to push for transformative change. Krugman’s thought, here and elsewhere, thus presents us with an initially baffling contradiction. Having spent more than ten years advocating for a sweeping overhaul of America’s healthcare system, he is now warning Democrats about the dangers of actually carrying one out. And having once called for a “new-New Deal,” he is again signalling his opposition to the most popular and electorally viable Democratic candidate in a generation who aspires to anything of the kind. 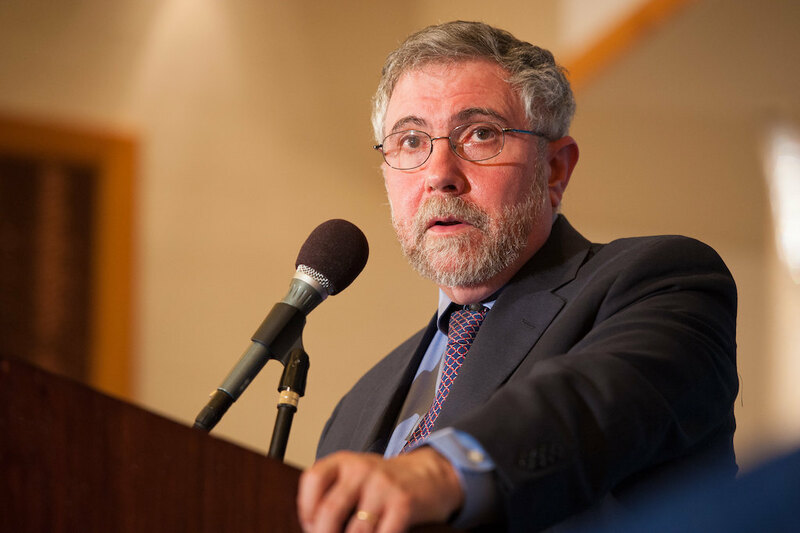 Parsing these apparent tensions proves a revealing exercise, not only in making sense of Krugman’s politics but also in illustrating the limitations of the reform-minded liberalism he has long championed — and the necessity of going beyond it. Paul Krugman has always been something of an oddity among liberal columnists. Say this for Krugman: though an unabashed liberal…he’s ideologically colorblind. He savages the supply-siders of the Reagan—Bush era with the same glee as he does the ‘strategic traders’ of the Clinton administration. While excessively lavish, Hersh’s 1996 profile accurately describes the eclecticism and periodic tendency to go after figures on his own side that have arguably made Krugman a more distinctive and compelling voice than the average liberal columnist. A vocal critic of austerity after the financial crash of 2008, he spent years hammering the Obama administration for its general lack of boldness and dewy-eyed fixation with bipartisan compromise — a decidedly unfashionable posture in the post-“Change We Can Believe In” cultural ecosystem. His columns have frequently taken aim at the boneheaded narratives and orthodoxies that prevail within the Beltway’s credulous pundit class, from the bogus obsession with deficits to the chattering class veneration of graph-wielding reactionary Paul Ryan. His writing on unemployment and inequality, though a bit wonkish, has often conveyed some sense of moral urgency and a genuine appreciation for the welfare state. Unlike the newspaper which has long published him, Krugman also opposed the Bush administration’s torture policies and its war in Iraq. Nevertheless, while some of these positions have indeed set him apart from other prominent members of the commentariat, he has never been a figure of the left. Almost feverishly partisan for Hillary Clinton in both 2008 and 2016, Krugman’s writing in the nineties and early 2000s variously opposed rent control and living wages and defended some particularly ugly aspects of neoliberal globalization (one March 1997 column, for example, was quite literally titled “In Praise of Cheap Labor”). Describing himself as a liberal — with “liberal” said to imply “more or less what social democratic means in Europe” — his political positions have tended to be something of a melange: often torn between abstract commitment to social-democratic ends and practical opposition to the means required to achieve them. Krugman, for example, has not only cited single-payer as the ideal healthcare model but effusively praised the Danish welfare state, Sweden’s fiscal policies, and the Scandinavian model of relatively high taxation. Even more bemusing, especially given his present posture, is that his own 2007 case for healthcare reform was essentially a moral one — the basic contours of which were sound. You’d be hard pressed to find more than a relative handful of Americans who consider it right to deny people healthcare because of preexisting conditions, and polls suggests as well that a large majority believe that all American citizens should be guaranteed health care regardless of income. The moral case for universal healthcare isn’t in dispute. Instead the opposition to universal health care depends on the claim that doing the morally right thing isn’t possible, or at least the cost – in taxpayer dollars, in reduced quality of care for those doing okay under our current system – would be too high. This is where the facts and figures come in. The fact is that every other advanced country manages to achieve the supposedly impossible, providing health care to all its citizens. The quality of care they provide, by any available measure, is as good or better than ours. And they do all of this whole spending much less per person…than we do. The progressive agenda is clear and achievable, but it will face fierce opposition. The central fact of modern American political life is the control of the Republican Party by movement conservatives, whose vision of what America should be is completely antithetical to that of the progressive movement. Because of that control, the notion, beloved of political pundits, that we can make progress through bipartisan consensus is simply foolish. On health care reform, which is the first domestic priority for progressives, there’s no way to achieve a bipartisan compromise between Republicans who want to strangle Medicare and Democrats who want guaranteed health insurance for all. While the force of these arguments is somewhat blunted by the author’s insistence that he’s advocating conservative ideas (“To be a liberal,” he writes elsewhere, “is in a sense to be a conservative — it means, to a large extent, wanting to go back to being a middle class society”) they nevertheless present a convincing and coherent case for an agenda more ambitious than anything mainstream Democrats have campaigned on in decades. Soon after the book’s publication, healthcare became a central issue in the Democratic primaries — a contest into which Krugman would quite forcefully intervene. Given his 2014 about-face on the Obama presidency (which Thomas Frank accurately called a “sloppy wet kiss”), it’s easy to forget just how fierce Krugman’s hostility to 2008’s Obama-mania really was. Not only that, but many of his initial instincts about America’s eventual forty-fourth president proved to be entirely correct. From the beginning, I wondered what Mr. Obama’s soaring rhetoric, his talk of a new politics and declarations that ‘we are the ones we’ve been waiting for’ (waiting for to do what, exactly?) would mean to families troubled by lagging wages, insecure jobs and fear of losing health coverage. The answer…seems pretty clear: not much. I’m not worried about the issue of costs…The real risk is that health care reform will be undermined by ‘centrist’ Democratic senators who either prevent the passage of a bill or insist on watering down key elements of reform. I use scare quotes around ‘centrist,’ by the way, because if the center means the position held by most Americans, the self-proclaimed centrists are in fact way out in right field…Honestly, I don’t know what these Democrats are trying to achieve. Yes, some of the balking senators receive large campaign contributions from the medical-industrial complex — but who in politics doesn’t? If I had to guess, I’d say that what’s really going on is that relatively conservative Democrats still cling to the old dream of becoming kingmakers, of recreating the bipartisan center that used to run America. But this fantasy can’t be allowed to stand in the way of giving America the health care reform it needs. This time, the alleged center must not hold. Prior to finally bending the knee in 2014, he would pen many more columns in the same vein. Through several successive election cycles, Krugman made the case that American politics was desperately in need of a sweeping progressive realignment on the scale of New Deal —routinely challenging many of the Beltway narratives which nourished the status quo and declaring universal healthcare a moral and political imperative. Yet there has always been a peculiarly conservative dimension to this thinking, as evidenced by, among other things, his ultimate prescriptions for healthcare reform and his eventual rank hostility to Bernie Sanders. Having deemed the single-payer model superior to all others and chastized those advocating a compromising approach, Krugman’s The Conscience of a Liberal doesn’t actually argue that Democrats should campaign on it. His stated reason for this was all the more puzzling given the force of his own arguments to the contrary in the same book: namely, that liberals must, regrettably, mitigate their expectations in the face of inevitable opposition. The inevitability of fierce opposition, it seems, was a reason to narrow the horizons of liberalism’s reform ambitions after all, as was political accommodation with the profiteers of corporate America and a Republican Party certain to lie tooth and nail about the realities of single-payer healthcare. There’s a different story on the left, where you now find a significant number of critics decrying Obama as, to quote Cornel West, someone who ‘posed as a progressive and turned out to be counterfeit.’ They’re outraged that Wall Street hasn’t been punished, that income inequality remains so high, that ‘neoliberal’ economic policies are still in place. All of this seems to rest on the belief that if only Obama had put his eloquence behind a radical economic agenda, he could somehow have gotten that agenda past all the political barriers that have constrained even his much more modest efforts. It’s hard to take such claims seriously. …on the left there is always a contingent of idealistic voters eager to believe that a sufficiently high-minded leader can conjure up the better angels of America’s nature and persuade the broad public to support a radical overhaul of our institutions. In 2008 that contingent rallied behind Mr. Obama; now they’re backing Mr. Sanders. There are several ways of responding to this charge, the most obvious of which is to cite the empirical data suggesting that there is indeed a potential popular, majoritarian coalition in favor of transformative policies like M4A, a Green New Deal, and the very same tax hikes that, according to Krugman, make them politically infeasible (though also, somehow, perfectly feasible in Scandinavia). But the more relevant problem is with Krugman’s general theory of political change and his apparent inability (or unwillingness) to understand that Sanders’ overall strategy is categorically different from the one practiced by candidate Obama: seeking to galvanize genuine pressure from below behind a clearly-articulated program and break, rather than accede to, the obstructionist realities of the American system. It hardly needs saying but “transformative rhetoric” can take different forms and, unlike Obama, Sanders clearly harbors no illusions about the difficulties he’ll face in trying to implement his altogether more ambitious agenda — in many ways, that very understanding is what informs his style of campaigning. Paul Krugman remains a somewhat distinctive figure within America’s liberal commentariat: a writer who, triangulations notwithstanding, has often displayed more progressive instincts than the corporatist liberals that dominante the upper echelons of the Democratic Party. An effective, albeit erstwhile, critic of centrist credulity, he has also proven more willing to challenge the orthodoxies of his own side than some of his peers. These facts make Krugman’s diffident embrace of glass-half-emptyism all the more striking. Despite his demonstrated ability to articulate the necessity of pushing major, fundamental change, he remained intent — even in 2007 — on managing his own ambitions downward in the face of potential opposition. The old cliché that politics is the art of the possible is, of course, correct. But it’s also the art of defining what the possible can be. And when popular expectations have plummeted amid decades of defeat, failure, capitulation, and rampant injustice, raising them may well prove the most vital — and potentially transformative — political task of them all. Nancy Pelosi, Which Side Are You On?